I wanted a panini tonight and didn't want to try to find some gluten-free bread at the store. Plus, it's hard to find a loaf that tastes any good, isn't loaded with other ingredients I still don't want to eat, & isn't super dry. I found this recipe from Paleo Plan and decided to give it a shot. It turned out pretty delicious and worked perfectly for my panini! I also love the fact that I could make it quickly at home and didn't leave dinner with a bloated, grumbly, & upset tummy like typical bread does to me. 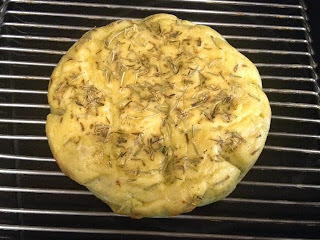 For the bread, I used Rosemary and Thyme for the herbs on top. The thickness of the bread worked out really well to simply cut in half, stuff with goodness, and toast it in my panini maker. The inside of the bread is a little more "spongy" than your typical bread, so I decided to use the inside of the bread as the outside of my sandwich so it would get nice and toasted. 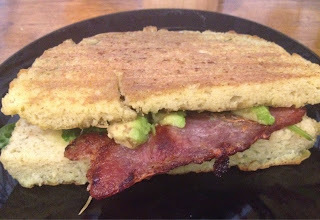 For the panini, I ended up putting bacon, grass-fed cheese, spinach, and avocado inside. Soooo good! 2. Beat the eggs with the coconut cream until smooth. 3. In a medium bowl, combine the coconut flour, salt, and baking soda. 4. Add the egg mixture to the flour and stir until well combined. 5. Line a pie plate or small jellyroll pan with parchment and spread the batter in the pan. 6. 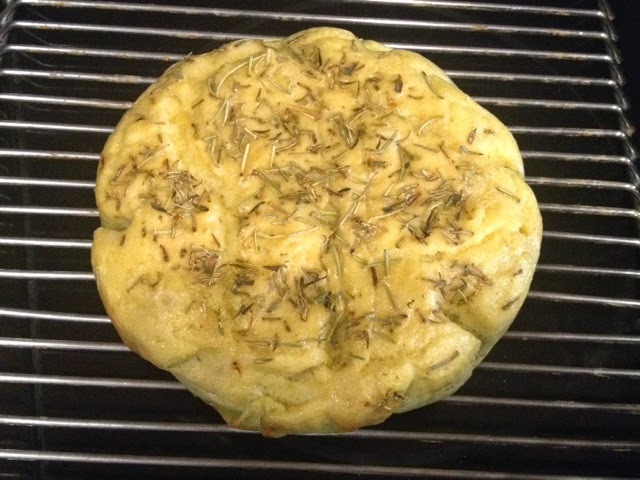 Drizzle with olive oil and press your fingers lightly in the dough to indent. 7. If topping the bread, add toppings evenly. 8. Bake for 20 minutes or until top is lightly browned. 9. Remove from the oven and brush with more olive oil. Cool before slicing and serving. Still going strong with the love languages challenge this week?